Can You Press CMYK T Shirt Transfers On Non-White T-Shirts? People like choices. That’s one reason why, when looking at an array of custom printed white shirts, a customer is likely to ask for something on black or another color. But printing on black can be problematic. Rather than disappointing them and saying you can’t do that, take a proactive approach and offer white, pastels and GREY. Given the option of a few different colors, most people are more likely to pick from that selection and be happy with their choice. But you’ve been told ChromaBlast and CMYK Laser printers can only print t shirt transfers for white shirts, right? Not quite. It’s true you can’t use these processes to decorate red, green, or royal blue fabric shirts, but you can decorate grays. Think of gray as the new white. Here’s the explanation. All of these garment decoration transfer technologies use the standard process colors: cyan, magenta, yellow, and black. CMYK is a subtractive color space that works by altering the reflection of white light. This works because the inks are not quite opaque. After the CMYK inks are applied to white paper or fabric, white light passes through the ink, hits the white substrate and reflects back toward your eyes. As the light passes from the white substrate through the ink, the pigments in the ink subtract a portion of the reflected light. Cyan ink subtracts a specific wavelength from the full spectrum so the light that hits your eyes looks blueish. Yellow ink subtracts a different wavelength of light so the light that you see look yellow. And so on. If you print a t shirt transfer CMYK image on a green shirt, the light passing from the substrate through the ink or toner is already diminished. So the inks aren’t going to work because they’re not starting with the full wavelength of white light. What do wavelengths got to do with gray shirts? Gray is obviously not white. And just as a green shirt steals part of the visible light spectrum from the inks, a gray one is just as larcenous. But the gray shirt is a fair-minded crook. It steals a little bit from the entire spectrum, so the light that comes through the ink is not white, but the spectrum is evenly diminished. In plain language, the colors you will see from a t-shirt heat transfer print on gray aren’t as vibrant as they would be on white, But they are essentially color correct (See Fig 3). Any unprinted area of the image will be more affected because areas that you mind would normally see as white are now gray. But most brains compensate for that as if they were viewing the scene in a darkened room. The same principle allows users of ecosolvent printers to print on chrome, reflective, and silver holographic vinyl. The bottom line is you can expand your product offerings by adding gray shirts to your inventory. Your ChromaBlast, and GO UNO or OKI C831-TS transfers won’t look quite as colorful. But with so many “grunge”, burnout, and aged garments being sold, there’s a big market for color transfers that look a bit more subdued. Printing on gray might be an easy way to appeal to these buyers. Of course the OKI C831-TS can be used to decorate black shirts using vector graphics. But a photographic image like the Vinson Tigers image in fig 3 will only work on white and gray scale shirts. 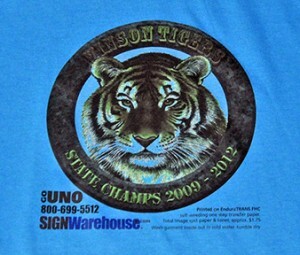 You may be wondering why we haven’t mentioned dye sublimation. 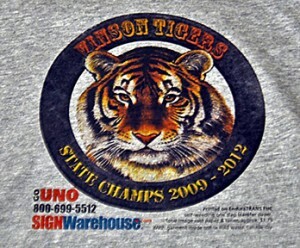 Sublimation on gray isn’t as effective because the process dyes the fabric rather than adding a layer of ink or toner. Sublimated gray shirts tend to look somewhat greenish, even if you choose the gray scale option in the Sawgrass Powerdriver. So if you’re doing sublimation only, your best bet for adding non-white apparel with your Sawgrass inks is to print on our SubliTex polyester heat transfer film. You’ll find more about that here in our SubliTex article. But if you’re a ChromaBlast, GO UNO, or OKI C831-TS user, you can expand your product line. Offer your customers choices. More choices may encourage your customers to pick from the selection you offer instead of asking for something you can’t sell. Broaden your printed T-shirt selections with gray. It looks almost as good and offers your customers more of what they want. Gray… It’s the other white t-shirt.